Well I have finished my contribution to Joy's NYB quilt. 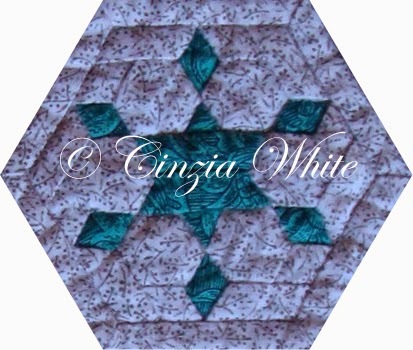 The inner arcs were taken from the wedding quilt and the extra arc was designed to extend the circle from a 9in to a 13.5in circle. Should be interesting to see what fabrics Joy uses. 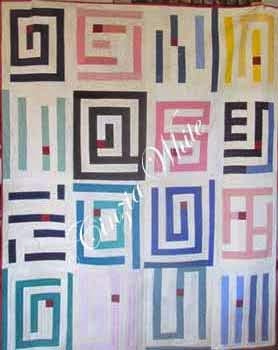 Well what do you think of this version of the wedding quilt? Joy has been making the New York Beauty blocks for one of her grandchildren for several months now. He has requested a quilt with paisley. Isn't it amazing what children ask for and what surprised her even more was that he actually knew what paisley was. She had searched high and low for something other than the traditional dull mud coloured paisleys we are all used to and one day came across the fabric in the background. Isn't it a beauty? 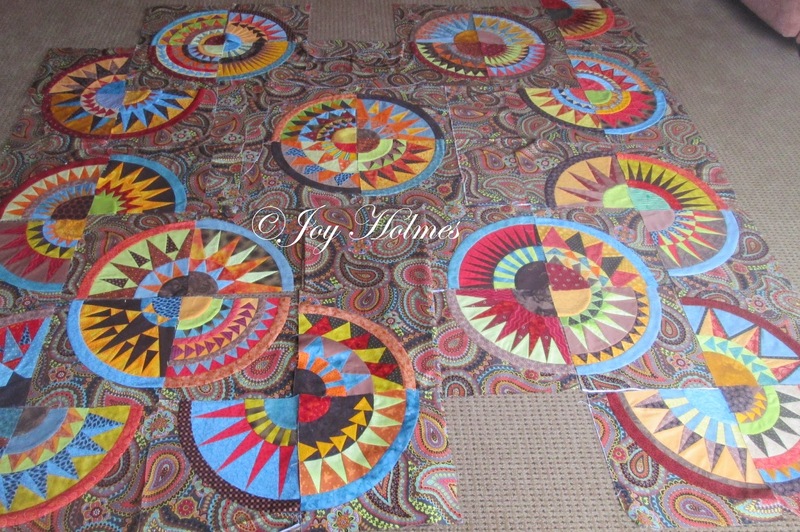 Joy had found a layout that she loved and wanted to substitute the NYB blocks for the circles in it. Only one problem with her original layout .... there was no where to showcase the fabric. So change of plans was called for. She decided that my wedding quilt layout would suit.... it also only needed another 12 blocks as opposed to her original design. So a few days ago we sat down together to design the setting for her centre. 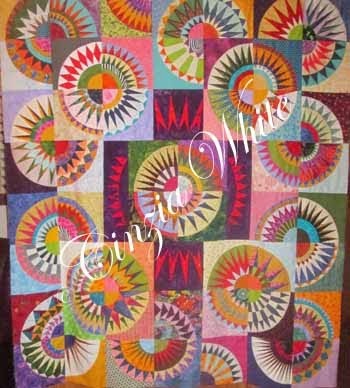 Unlike my quilt, where I have many different backgrounds Joy has only one. We didn't want to bring in another to frame the centre and we didn't want just the feature fabric as that would leave the centre all lost and forlorn. 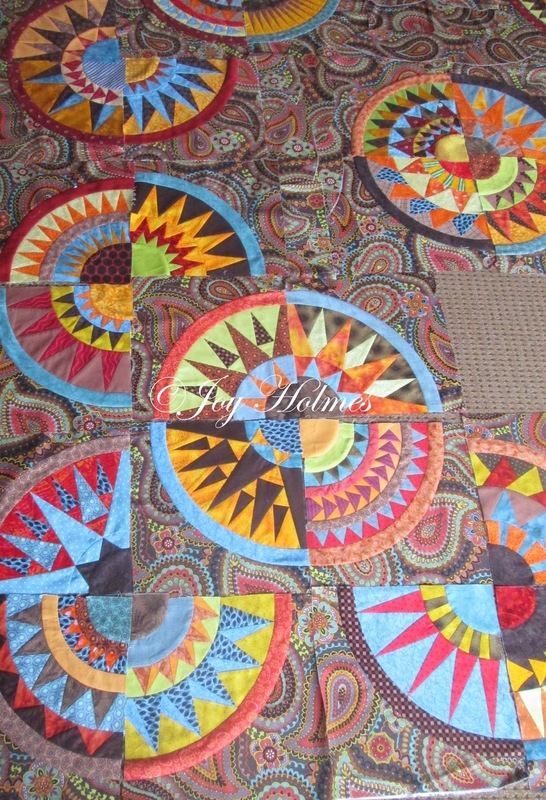 Joy chose four of my wedding quilt blocks and then I drew up various designs extensions to take the circles out to 15in. Thankfully it only took a few hours to draw ones that matched what Joy was looking for. Lucky she doesn't need them right away as I am flat out with other things I need to do, but if you check back in a few days I will put up the design here so you can see how different it is. It will probably take her another month to make the extra blocks and the centre then I will post that also. 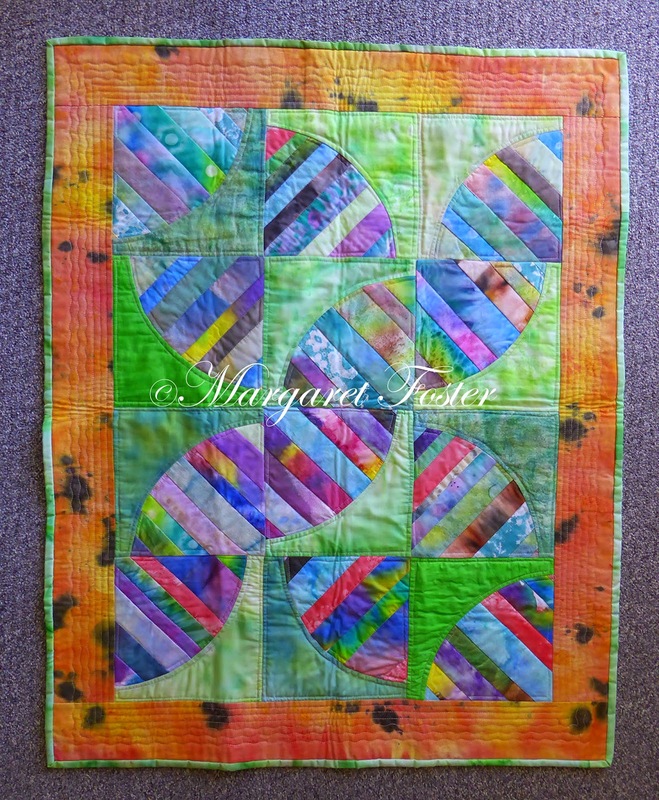 I said I would show you the quilt that I practised my FMQ on earlier this month. Most of the blocks in this quilt, Thoroughly Modern Topsy, were made by people from Nowra Quilters when I was teaching them how to do QAYG. We decided to also add some life to the back of the quilt and as you can see from the photo here on the right the backing looks pretty good too. After making the blocks various people, me included, added some extra quilting ... just to practise. It was a good practise size as the blocks are just 18in by 22in. I then had the fun of joining the whole thing together. Just over a year ago I taught a class to women from Bateman's Bay and Margaret decided to make two of the classes that were offered. 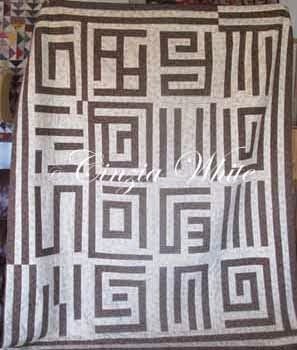 It was one of my Scrooge Quilt workshops where people can use any strips they have lying around. 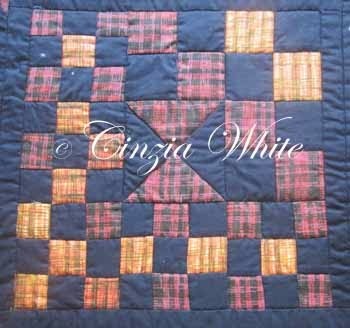 Any width, any length, any colour... just use up what you have is the idea..... that's where the name Scrooge Quilts came from. In the class I offered four different quilts that all start the same but then deviate quite dramatically depending on what you want. Margaret dyes her own fabrics and wanted to use those and didn't they come up beautifully. Oh btw if you want to do a dyeing workshop with her you can find out the details here. The adventures of the young. My youngest son Richard is in Sierra Leone with the WHO contingent fighting Ebola. He is a data manager and had set up a monitoring system to track people from suspected Infection to either recovery or burial..they have to track past death to make sure that people are buried in a safe manner. He was staying in a hotel but has now moved to a tent city as he and his supervisor got fed up with there being no food and atrocious living conditions in the local hotel. When Richard arrived he asked for light globes as his room had none. After a few hours they found some and he discovered why there were none in his room. The electricity isn't wired correctly and the only way to turn them on or off is to literally turn them.... as in screw them in or out of the sockets. There was only ever food for the first five people, after that it ran out. When you left the hotel in the morning you had to leave you key at the desk as they don't have spares. On the final evening that they were at the hotel Richard and his boss returned home at 8:00 after having been working since 7:00. No one could find the key to his bosses room and there was no food. After two hours they literally knocked down her door as key was still not to be found. So she spent the night in a room without a door. In the morning she hit the roof and told Richard they were moving to the Danish tent city. Richard says it is great ...... they have food and vegetables. He hadn't seen a vegetable for almost three weeks. He arrived in Sierra Leone just under three weeks ago. Days are very busy. Rise at 6:30. Breakfast between 7:00 and 7:20. One the road at 7:30. Work til 7:30pm. Then home, dinner, bed by 9:00. He looks totally exhausted but has learnt a lot. They are very happy with his work and wanted him to return to Freetown to draw some graphs for them and then to move to another area and set up the same thing there. He refused as he said it will take him the better part of his remaining time to train some of the Brits to maintain the system. This is the first time they have been able to get any reliable figures from this region. Once the Brits go it will unfortunately all collapse but hopefully they will be there for a few more months. Plus he can draw the graphs from his present locality and email them up. Well have finally managed to piece the central frames and join all of the blocks together. I'm not sure if I like it or not but will now start to work on the border. I had initially planned to have plain borders but have now decided to return to a long ago plan of a spiked border ... also somehow incorporating curves. Will be interesting to see what I can come up with. Yes the camel quilt is a true quilt. 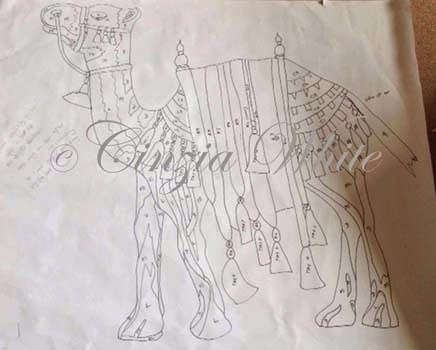 I found a series of photos of different camels, plus a few stitchery designs that I liked the look of. 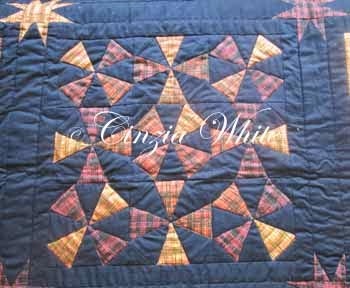 I contacted the original designers asking if they minded my basing my quilt on their designs and all were happy with that. I went out to a friend of mine who does lots of applique and she simplified it for me and viola we have the design for Hilde's camel. I have even collected the fabrics for it. I was going to say I bought them but in truth I had most of them already. I did buy the fabric for the background which are a mixture of creams and contrasts sewn together as a 1600 quilt. 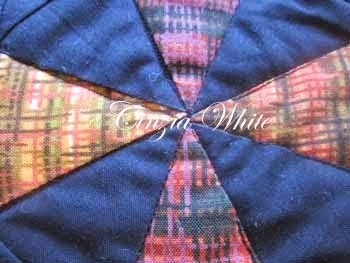 I went to a shop and asked them could I have a jelly roll cut out of fabrics I chose if I was willing to do the cutting. They were willing to let me and so 40 strips later I had the perfect background. Ok so just for those of you who think I do nothing besides quilting here are two photos to show you that there is life outside of quilting. 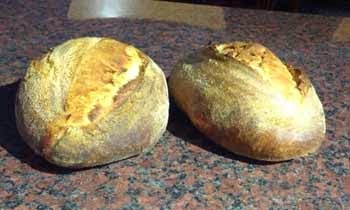 Do you know that making your own sourdough bread is a great way to spend several hours. In case you don't have several hours to spare then you just are not going to fit it in. I generally make two loaves a week. When I started it was quite a task but now I am even able to quilt between the different stages. From the second photo one would assume that I also have chickens. Not quite I hope to have chickens one day...when I stop travelling. Paul was going to give me chickens for Xmas but then we had to go away for a few weeks and at that stage realised that dogs may be a problem when you go away but they can always be taken to the kennels. 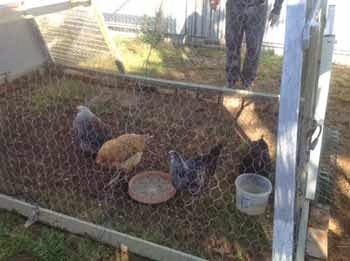 There are no equivalent facilities for chooks.... so no chooks for now. Oh these are my brother in laws chocks. Don't they look cute? A friend just sent this bit of advice to me and I thought it was worth sharing with my other friends. 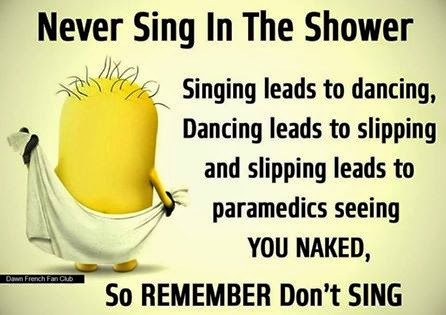 I'm fortunate that I have never been one to sing in the shower but for those who do partake of this activity be warned! Well the past fortnight was not as productive as my first fortnight in the FMQE but I did manage to complete some more ditch stitching and I am improving so all is not lost. As for the next fortnight I think I will need to change my time frame to monthly as I have so much on my plate at present that I can see myself throwing in the towel if I commit to too much. So my target for the next month is to ditch stitch a different quilt...after finishing off this one. Last week I took one of the many quilt tops that has been languishing on my spare bed to quilting and with some friends basted it. Although it would benefit from more than simply in the ditch stitching I intend to first ditch stitch it...purely for the practise. After that is finished I may add some more FMQ ... But not in the near future. 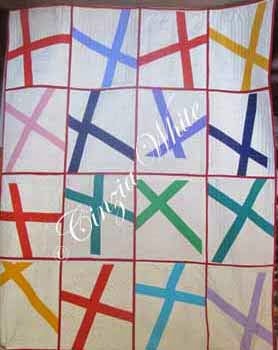 It was my second attempt at reproducing an antique quilt that a friend purchased several years ago. The colour differentiation in the first wasn't the best and so as I still liked the design I made a second one. 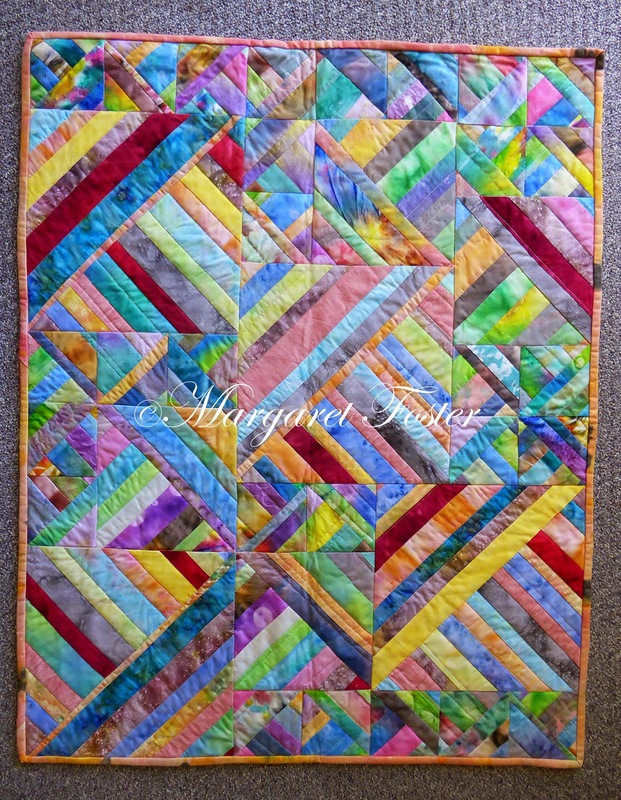 It's not often that I reproduce a quilt which I haven't been happy with. I usually just move on but I did like this design and am happy that I redid it. 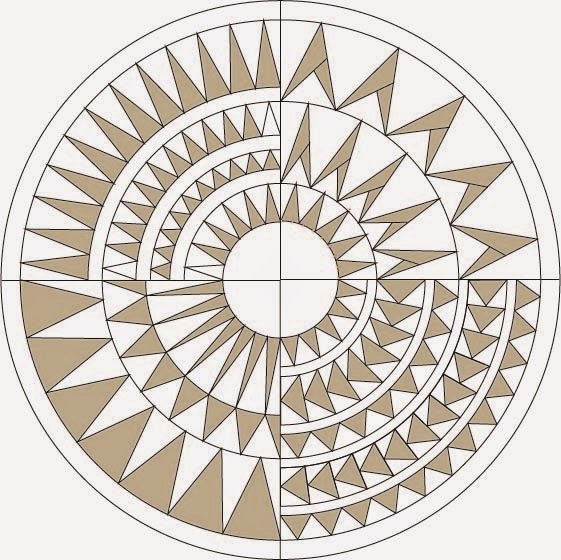 Will have to dig out my first quilt using this design and you will see that colour, or in truth value, makes a world of difference. Perhaps next month.